Making Musical Connections – Stephen Emmer’s ‘International Blue’ showcase at Abbey Road Studios | Don't mention the M word! 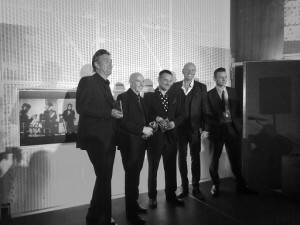 The collaborators: Neil Crossley, Midge Ure, Stephen Emmer, Glenn Gregory, Liam Mckhaey and virtually: Tony Visconti. It’s not what you know, it’s who you know? Well it’s handy that a facebook friend (and real life friend) of mine is head of press for a leading music PR agency and this led to an invitation to a very special showcase event at Abbey Road yesterday. “Who you know” was also a theme of this showcase, which featured: Stephen Emmer, Tony Visconti, Midge Ure, Glenn Gregory, Liam Mckhaey, Neil Crossley and Michael Dempsey as they presented their new collaborative album – ‘International Blue’. 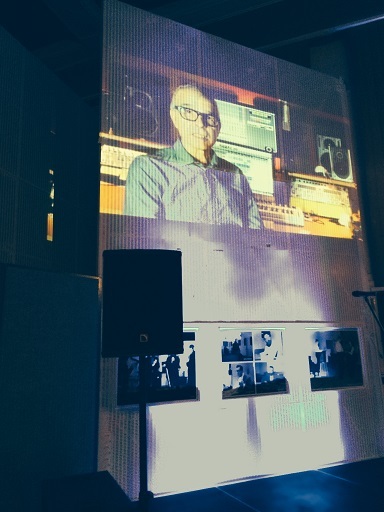 Introduced by veteran DJ Janice Long, the event featured a video appearance by legendary producer Tony Visconti. Tony Visconti, beamed in via video connected with Emmer originally on My Space. ‘International Blue’ is the brainchild of Stephen who wanted to take some of the best baritone singers from 80s and 90s and set them amongst a expanse of musical arrangement and modern production – to create a magical, Bond movie-esque album of original modern ballads in the style of The Walker Brothers – yes, the return of the full-on crooner. Stephen previously worked with the great Billy Mackenzie and The Associates, so certainly it’s no surprise that he has a penchant for powerful emotional and big-sounding vocals. What interested me with the event was that Stephen with his team – including my friend – were doing a DIY album launch. DIY in the sense that the from beginning to end this was a project driven by the creators rather than a record company, but they were still using record company tactics – a showcase, networking, press etc. The relationships between the collaborators were genuine, although they worked mainly virtually. Midge apparently recorded his vocals in a wardrobe while staying in a hotel. Stephen connected with Tony Visconti through MySpace a number of years ago. Tony spotted Stephen’s last project Recital, which featured Lou Reed, on MySpace – leading to them working together. It was interesting to hear that Tony Visconti was trawling social media sites looking for inspiration and ideas. Stephen said that he was introduced to Glenn Gregory – who was one click away. I assume he meant they connected on Facebook. Social media isn’t just about marketing or “getting out there” it’s about networking and relationship building for artists and professionals and is a platform for sharing ideas in the industry. People like Tony Visconti and Stephen Emmer are using social web to keep across what is going on in the industry and if you have good ideas and a clear vision, and you network it well online, it will get seen.